We’ve spent a great deal of time this year, along with other market observers, detailing the dramatic and relentless rise of gold demand around the world. China and India have received a lion’s share of our attention, and rightfully so as the world’s two largest gold importers by far. Collectively they are responsible for roughly 60% of global demand and their level of demand has been rising dramatically. Incidentally, our review of the numbers indicates that China has surpassed India as the world’s largest gold consumer although many commentators continue to give India that honor. Old habits die hard they say. However, the Asia focus has overshadowed the rise of gold demand from a smaller, but nevertheless significant source. 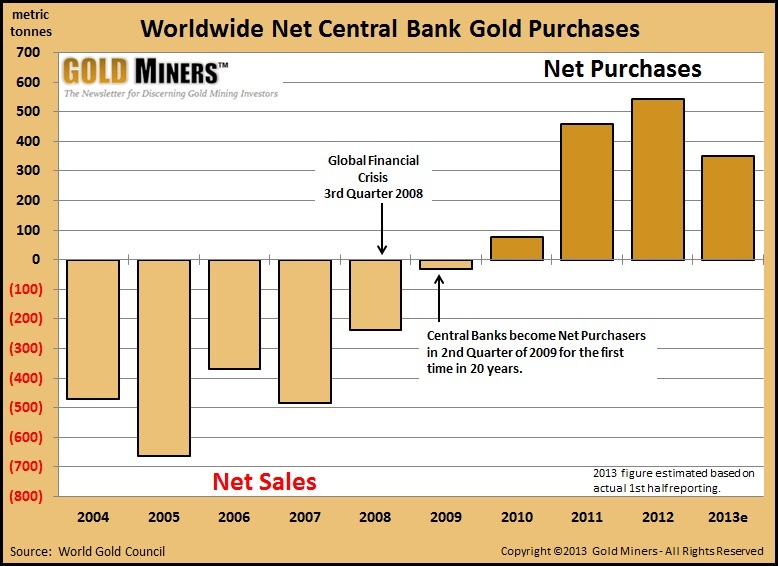 Central banks worldwide turned net buyers of gold in the 2nd Quarter of 2009 for the first time in 20 years. This was just after the onset of the Global Financial Crisis (GFC) in the 3rd quarter of 2008. Since that time central bank purchases rose to 12.3% of global gold demand in 2012. This prompted the World Gold Council (WGC), who keeps track of such things, to reclassify central banks as a component of global gold demand rather than gold supply where they had been classified for the preceding two decades. Central bank purchases reached 544 tonnes in 2012, a level not seen in the last 50 years! They have fallen off that torrid pace so far in 2013. Nevertheless, they are currently on pace to reach a sizeable 350 tonnes by the end of the year, representing an estimated 8% to 10% of global demand. The obvious reason behind the change in sentiment towards gold among central bankers is the unprecedented program of money-printing by the U.S. Federal Reserve. The dollar is of course the world’s reserve currency and therefore central banks around the world are obliged to hold a significant portion of their foreign exchange reserves in dollars if they want to engage in international trade. However, the untested nature of QE and the inherent likelihood that it is undermining the stability and long-term value of the dollar has caused central bankers to take the prudent step of expanding their gold holdings. 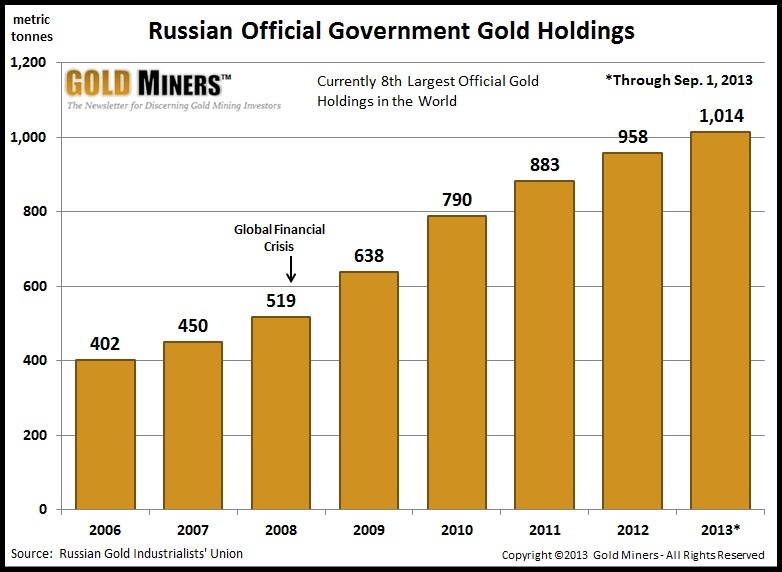 Russia serves as a poster child in the emergence of central banks as gold buyers since the GFC. In our article published last week, “From Russia with Gold” (http://www.gold-eagle.com/article/russia-gold ) , we highlighted the steeply rising trend of official Russian gold purchases. Here again is the chart for reference. Russia has added approximately 500 tonnes to their gold holdings since then, representing roughly 38% of worldwide central bank purchases. As a result, they currently have the 7th largest gold holdings in the world at just over 1,000 tonnes. China of course remains opaque about their gold holdings. Officially, they maintain that their holdings have not changed since 2009 when they last reported having reached 1,054 tonnes. This is the figure that the WGC continues to report in their quarterly demand trends publication. However, all of the available evidence, and there is plenty, suggests the Chinese have been accumulating official gold reserves on an historic scale. As a sampling, China is on track to produce more than 420 tonnes ( http://www.gold-eagle.com/article/game-over-there%E2%80%99s-still-time-left-clock ), which would be a record. No second place contender will even approach 300 tonnes. And very little, of their production, if any, leaves China. In addition, they are importing unprecedented amounts from the rest of the world, as the latest Hong Kong import/export figures show. 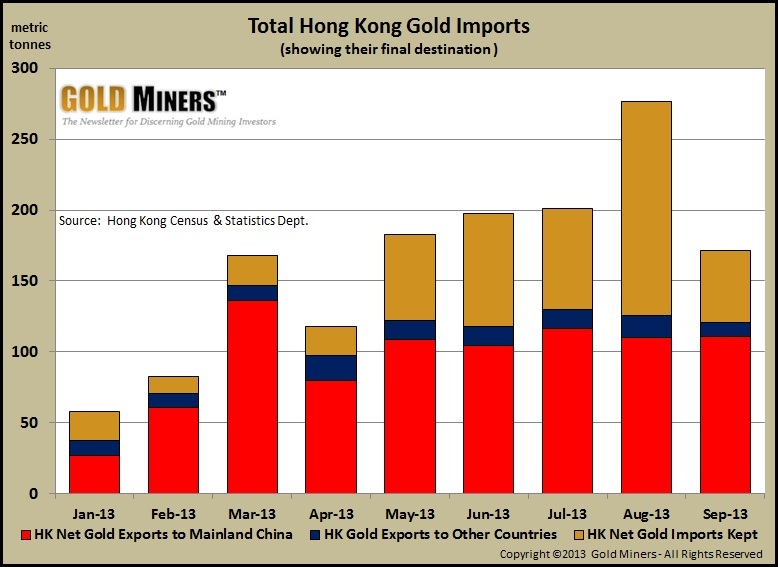 Hong Kong imported 171 tonnes of gold in September and 110 tonnes of it went to the Mainland. Since March of this year, Hong Kong has exported over 100 tonnes per month on average to the Mainland (in red below). In our recent article, “China’s Tentacles Grip World”( http://www.gold-eagle.com/article/china%E2%80%99s-tentacles-grip-world-%E2%80%93-gold-miners-weekly ) , we quote an official from the China Gold Association in his year-end 2012 remarks stating, in the clearest possible terms, that the Chinese government views gold as a strategic monetary asset both domestically and globally. They have included similar but more detailed language in each of their last three 5-year plans, beginning in 2000. When you pull all of this together, it suggests that China very likely has far more than 1,054 tonnes in official reserves. In fact, the bulk of worldwide central bank buying since the GFC has come from emerging market economies. We covered the “R” and the “C” in the BRIC nations above, but Brazil has been a net buyer as well. And although the Indian government has come down hard on gold imports in an effort to halt the Rupees steep slide, they have made at least one noteworthy gold purchase. The Indian central bank purchased 200 tonnes from the IMF in 2010, and they recently clarified that despite the strong decline of their currency, India will not be leasing or selling any of their official gold holdings to help alleviate their monetary crisis. Turkey also deserves favorable mention. The central bank has been increasing their gold reserves alongside Russia. Turkey on track to have a record year for gold imports at an estimated 270 tonnes, and a significant portion of this is making its way to their central bank. Western central banks may not be big buyers of gold but they are not selling their gold holdings either…at least not publically. The U.S. reportedly has over 8,100 tonnes, Germany – 3,390 tonnes, Italy – 2,452 tonnes, France – 2,435 tonnes, and Switzerland – 1,040 tonnes. These represent the world’s largest holdings by comparison and so emerging market countries like Russia and Turkey are playing catch-up. Of course there has been much speculation in the media, including ours, that official gold reportedly held by the U.S. and Germany, for example, is no longer in the vaults. There is plenty of circumstantial evidence to suggest this is the case. Nevertheless, it is intriguing to note recent official pronouncements of how central bank and treasury officials feel about gold as a foreign exchange reserve asset. In July, Ben Bernanke stated before the Senate Banking Committee that he didn’t understand gold prices and he felt that no one else did either. However, the above statement from the U.S. Treasury Department suggests that officials have a better handle on the significance of gold than Bernanke’s bland indifference suggests. It would seem that regardless of official machinations to manage the price of gold, western monetary officials are well aware of gold’s importance in their reserve portfolios. The bottom line is that central bankers and treasury officials, the world over, know that gold is a critical component of their monetary reserves, regardless of statements of indifference or antagonism to the contrary. We believe that emerging market governments will continue to be net purchasers of gold going forward. The trend will continue for as long as central banks, led by the U.S., continue to flood the world with paper as a means of managing chronic budget deficits, unsustainable debt levels, and stoking exports through currency devaluation. Instead they are simply weakening the global monetary order in a race to the bottom. These same central bankers are aware of the likely volatile outcome. Therefore, those that have large reserves are increasingly clinging to them (e.g. Germany’s request earlier this year to have the U.S. return a portion of their gold reserves) and those that don’t are acquiring them quickly. We think they perceive a stormy monetary day on the horizon. Emerging market central banks have joined a global stampede, led by Asia, into gold. As a result, global physical gold demand (4,330 tonnes) greatly exceeds mined supply (2,840 tonnes), despite extreme gold price weakness. This year’s supply gap his largely been filled with heavy gold ETF selling in the West, stoked by taper-mongering from the Fed and anti-gold propaganda from the bullion banks. However, the ETF’s are down to roughly 2,000 tonnes. From our perspective, gold sellers are looking increasingly like a shrinking island in an ocean of demand. Currently gold and the shares of gold miners are deeply undervalued in light of supply and demand fundamentals. Therefore, we believe now is the perfect time to accumulate the shares of fundamentally sound gold mining companies that are poised to strongly leverage a rising gold price. We highlight such companies in our Model Portfolio, available to our premium subscribers. However, you can check out our Comparative Analysis Table, which provides many important metrics critical to evaluating and comparing gold mining companies. Its purpose is to help discerning investors separate the wheat from the chaff. You can find it by navigating to the version of this article posted on our website on the Weeklies page. That’s it for this week and thanks for reading!